Academics and writers have known about the therapeutic benefits of animals for many years. Mark Twain was regularly photographed with several cats draped over him, and a personal favourite image is of E.B. White sitting at his typewriter while his dog Minnie looks on. Contemporary academics and PhD students have adapted the trend for the modern age by posting pictures of their pets on social media with hashtags such as #academicswithcats #academicswithdogs #phdcats and #phddogs. The posting academic is usually suffering from feelings of isolation and writer’s block, and has momentarily found joy in the distracting antics of their pet. 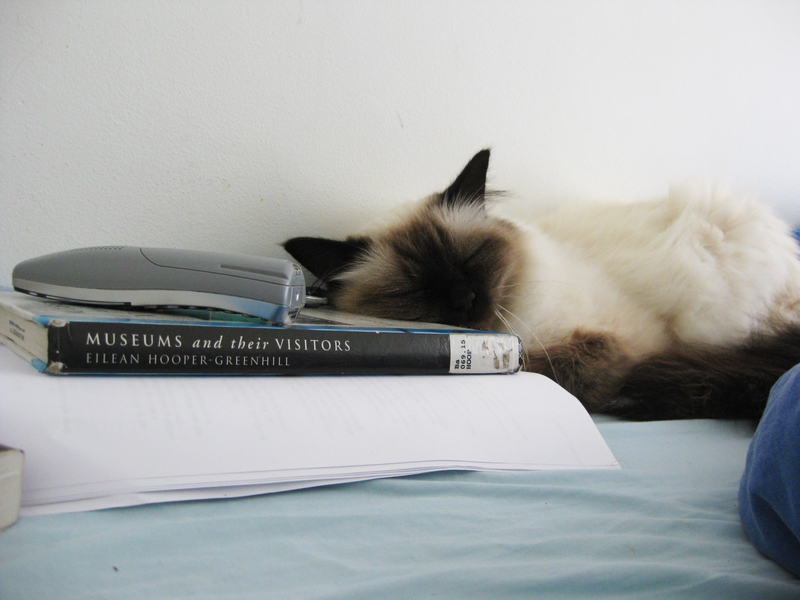 The accompanying image is generally their pet promisingly obstructing chapter drafts or sleeping on a stack of research texts. The animals in these posts are often referred to as ‘research assistants’ or ‘supervisors’. Obstructive behaviours are endearingly rebranded as ‘help’. These images are a tribute to the non-judgmental companionship of animals during thesis candidature, a time often characterized by isolation and uncertainty. In ‘Harry Potter’, and its less famous predecessor ‘The Worst Witch’, students are encouraged to bring an animal with them to boarding school as both companions and for more functional purposes such as delivering notes. In ‘The Worst Witch’ cats are book-listed and handed out to all new students on arrival. I sometimes feel that post-graduate students should be similarly equipped on enrolment, as frequent animal interactive can have a hugely positive impact on mental health. It is imperative to point out to pet-less academic writers that a thesis therapy animal doesn’t have to be your own. I spent the first few months of my candidature happily writing my literature review on the back-porch couch with our neighbour’s cat. Dubbed ‘Puddings’ by my partner, my ill-gained cat liked the fact that I was always home and would make a big fuss of him during periods of extreme procrastination. When his owners moved house and took Puddings with them, I was devastated and instantly contracted writers block. This was somewhat alleviated when Sam the cat came to live with us. He immediately took over Puddings’ duties and I went on with the business of trying to write a PhD. The value of a therapy animal to the hapless and overstressed graduate student is manifold. Firstly, writing up several years of research into a thesis is a solitary activity. Sharing a toilet-sized office with two other chatty PhD students can provide a feeling of solidarity, but in reality, if you’re also working two jobs and live an hour’s commute from Uni, you’ll probably elect to work from home. Animals provide the type of company that doesn’t prevent you from nailing that really tricky chapter. It’s also highly unlikely that they will do better than you in their confirmation hearing and boast about it for the next three months. If you’re anything like me, your best (V energy drink fueled) thesis writing time is between midnight and 4am, after which you will fall asleep on the couch, Fox Mulder style. There are very few other members of your household who will be interested in keeping you company at such an antisocial hour. Here, your thesis therapy animal can be relied upon to sit either under or upon your desk, giving your arm the occasional encouraging lick. This experience can also be simulated by stalking other people’s pets on social media. Animals provide warmth. Not just the sense of unconditional love that comes from pet ownership, but an increase in body temperature. My first three years of candidature were spent in a weatherboard house with no insulation. It was often colder inside than outside, and Sam proved to be an outstanding lap cat. By the same token, cats are drawn to the heat of laptop computers. If you have a heat-seeking cat, back up your work regularly. You have been warned. PhD students are often urged to practice ‘self-care’, a movement that endorses exercise, mindfulness, healthy eating, a balance between work and leisure. But personally, I believe that there is nothing so meditative as watching a cat clean its paws on a sunny window ledge. Thanks for this delightful tribute to our furry friends Jo! Now I’m wondering, do you share PhD times with a companion animal? I’d love to hear about them in the comments! This entry was posted in Getting things done and tagged pets. Bookmark the permalink. Lovely post. I have a cat who regularly offers his soft fluffy tummy for me to tickle. Rasberry blowing into same is an excellent meditation. His handsome face and beautiful markings need regular admiration – it is not for nothing he is known as ‘the boyfriend’ in this house. Really enjoyed this post I have a #phddog – he is a giver of calm in moments of stress and anxiety – which have been many lately! He is a simple soul from whom I can learn much – sleep, eat, walk, repeat – not so keen on the occasional rolling in poop though…! My three lapdogs are my constant study buddies. They help me nut out ideas aloud, listen to conference presentations and sit on my lap at times as I’m working on a draft. They stop me feeling isolated and lonely during long hours at the desk. And by demanding two walks a day, they make sure I get enough exercise to balance the sedentary hours. Couldn’t do it without them and wouldn’t want to either. My dog was a crucial player in my PhD journey. Not just as company on the lonely days writing, but he forced me into a routine of fresh air and exercise three times a day. Literally could not have finished without him. Over the weekend as I re-started my ‘do or die’ final chance to complete my PhD, I was distracted by my purring buddy Indiana the Jungle Cat. He is such a smart cat having been with me for the entire time I’ve been enrolled at uni (I don’t feel comfortable to say ‘studying at uni’). In studying and typing I most look forward to his companionship as he curls in a ball or stretches out by my side. I totally agree. Animals are the best PhD therapy. My special Mr Kwenchi was there with me through my seven years of Masters and PhD, allowing me room to concentrate and focus on my work but also providing breaks when he interrupted me for food, warmth or cuddles. He clambered over my keyboard and papers, sat on my lap or lay curled in his bed next to my desk. As he and I lived alone, he provided me with the companionship and night-time snuggles that meant I never felt lonely. Sadly, three weeks ago his compromised kidneys failed. My research assistant had lasted just long enough to see me through my studies. Thanks Jo for this wonderful post. My labrador Ella will always be attracted to food over writing, but somehow she knows when I am concentrating or getting annoyed with a paragraph, and so leaves me alone. Only when she knows I ‘appear’ to have it under control does she come into the study. However, more recently, she has quietly made her way into the study more often, to keep me company by lying right under my desk or sitting right next to me so that I feel obliged to scratch her head while typing with one hand… Having Ella’s company, and the sunshine she brings, makes me grateful that I have the opportunity to study and write. Great post. I got a dog during my first year after feelings of isolation. She’s currently curled near me and has made a massive difference. I now get out of the house twice a day, I feel much healthier and happier. If/when I finish my thesis she will feature at the top of the acknowledgements. Great post! I use my disabled son’s therapy chickens. We have 24 of them including 6 cockerels. They help my son get up and move around, something he finds difficult and painful o do if he has no reason to get up. They have also been of great help to me too, getting me up in the morning with their doodle doos. I have even practiced my presentations on them, although they often walk away half way through! Fantastic post, beautifully written, really getting at the heart of what pets do for us – unconditional love and support. I am about to start on my PhD journey and I know my two little baby pomeranians are going to provide the light forward during those tough times all Phd students seem to move through. Just looking into a pets eyes there is so much understanding at just the right moment giving inspiration to go on against all odds. Several pet baskets are already set up in my study as I will be a remote student. So my fur babies will be an integral part of ensuring I go the full distance. The connection and communication with a dog or cat (I have one of each) is a wonderful thing; an interspecies connection! I could write a whole blog about how important it is to rest the working brain, to move away from the keyboard and journals and step outside. My Labradoodle is very good at reminding me to move twice a day for our brisk walks around the neighbourhood. Walking a dog is a social activity, it’s good exercise, changes your focal length, helps me work through sticking points and can be as spontaneous or routinized as I want it to be. For late night writing sessions, my Blue Russian cat is always there as a supportive presence. My PhD companion animals are very much appreciated! My ‘third son’ snores on his bean bag next to my desk, insists on tummy rubs, and gives me guilt-inducing walk-me big eyes and whines when I have been stuck to my computer for too long. Or brings me his ball for a tug of war to cheer me up, when I am down. He joined me a year ago, but what a difference he has already made. Thanks for a great post. Two thesis cats and four thesis dogs. My study is actually the cats’ day-bedroom: they kindly let me put my computer in here, one is asleep in her bed at the end of the desk, the other is on ‘their’ couch. The thesis dogs walk me every morning and make sure I stay in the moment by racing off to bathe in cowdung if I get distracted. The thesis would probably have gotten done a lot quicker without their help, but I’d be less fit and healthy! Great post! My dog Lucy and my cat Sooty keep me company during lonely writing times. And they help me (at least the dog) to go for walks and to get out of the headspace and smell the roses beside. Makes all the difference in continuing my writing up phase. Lovely post. It reminded me that there were many weekends while doing my PhD when I realised the only time I used my vocal cords was to talk to my landlords two dachshunds Bubble and Chubby! They definitely made a journey that at times can be extremely lonely, that much more bearable.